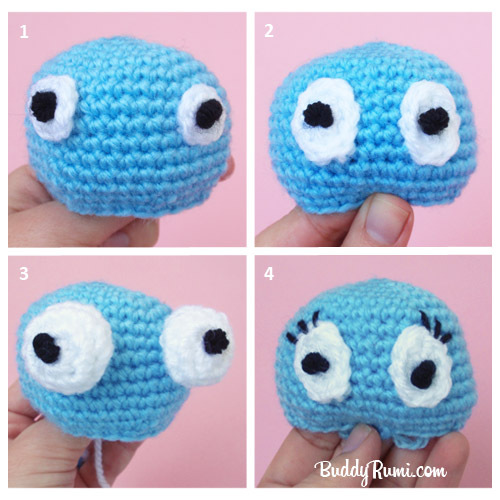 Today I wanted to show you that you don't need to use the safety eyes in your amigurumi, you can have fun and cute eyes with just a strand of yarn. You can have him sick (1), happy (2), sleeping (3) or with its eyes shut (4). 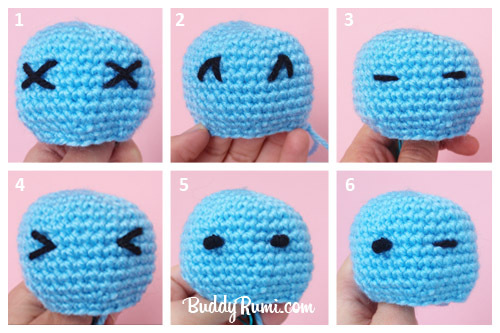 You can even embroider two French knots and you get two round eyes (5), or a French knot and a dash and you get a winking amigurumi! All this with just a small strand of medium weight black yarn. If you want something more elaborate you can give the eyes a background turning the black dot into the pupil of the eye. 1: 6sc in Magic Ring and needle join to the first stitch. Attach to the main piece. 1: 2sc, 2dc, 2sc, 2dc in Magic Ring and needle join to the first stitch. Attach to the main piece. Embroider one French knot on each eye with a contrasting color. Attach the eye to the main piece. 4 - An extra detail for an amigurumi girl: Embroider lashes on the eyes, making it more feminine in one simple step. If you know more ways to use our yarn to make eyes please share!